These easy lemon curd and raspberry tartlets are an easy way to use up any leftover lemons you or just because you want a deliciously sweet treat! I’m back with my second lemon curd recipe and this one is even easier than the first (especially if you already have lemon curd leftover!). 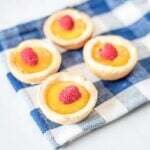 These lemon curd tartlets are made with a simple shortbread pastry (pie crust) dough. I like to make my own and press it into a cupcake tray to form the tart shell but you can also buy frozen/refrigerated pie crust or even ready to bake mini pie shells. Then all you have to is spoon in some lemon curd [get my lemon curd recipe here] and place a juicy raspberry on top. It couldn’t be simpler! Don’t leave the raspberry out. It cuts through the tartness of the lemon and balances the flavor profile perfectly. Cook over low to medium heat, stirring constantly with a wooden spoon, making sure to stir sides and bottom of pan. Cook until mixture is thick enough to coat back of wooden spoon, about 5 minutes. Remove saucepan from heat. Add butter, one piece at a time, stirring with the wooden spoon until consistency is thick and smooth. Transfer mixture to a bowl. Lay a sheet of plastic wrap directly on the surface of the curd to avoid a skin from forming; wrap tightly. Refrigerate until firm and chilled, at least 1 hour. Add the flour, sugar and salt to a stand mixer with paddle attachment. Beat on low to combine. Add cold butter, beat until butter is the size of small peas with the flour mixture. This can also be done in a food processor. With the mixer on, slowly add the ice water until dough forms and is combined. Transfer dough to a lightly floured countertop, kneading a couple times to combine. Divide dough in half, flatten slightly and wrap tightly with plastic wrap. Refrigerate for 1 hour before using. When ready to use, roll out the dough. Cut individual circles for each tart shell using a glass or pastry cutter. Push each circle into a greased cupcake tray. Bake empty tarts for 5 - 10 minutes or until a light golden color. Allow to cool. Fill each tart shell with lemon curd and top with a raspberry. These look yummy! What temperature do you bake the tart shells at, and how many does this recipe make?